The Films Division of India holds more than 8000 titles. Populist imagery from the inception of print culture in the 19th century. The national archive for England, Wales and the United Kingdom, holds over 1,000 years of the nation’s records including of the Indian Subcontinent history and people records, acquired and documented by the British Empire. 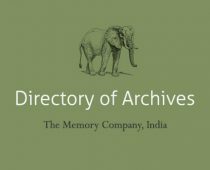 The Cinema Resource Centre (TCRC) is a public archive of Indian cinema designed to enable research on the audio-visual cultural artifacts produced by Indian films, especially those made in the regional languages of South India.